In 1927, when Alaska was still a U.S. Territory, Territorial Governor George Parks persuaded the Alaska American Legion to hold a competition. 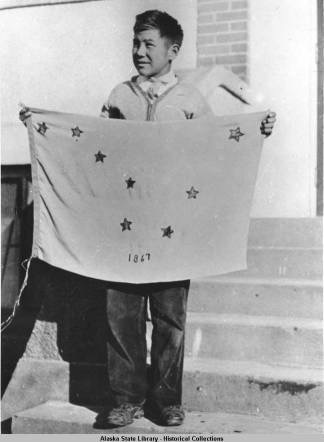 The Governor thought it would help the statehood movement by having a state flag, so the Legion held a contest, open to all Alaskan children, to design Alaska’s new flag. 142 designs were sent to Juneau from all over the state. A thirteen year old living in Seward, John Ben “Benny” Benson won the contest with a simple, yet elegant design. Benny Benson was born in the fishing village of Chignik. His father was a Swedish fisherman, his mother an Aleut-Russian. Benny’s mother died when he was just three, and the family home burned to the ground shortly afterwards. His father, John Ben Benson Sr, could not take care of his three children alone, so they were divided up. Benny and his brother were put into an orphanage in Unalaska; his sister Elsie was sent to a school in Oregon. 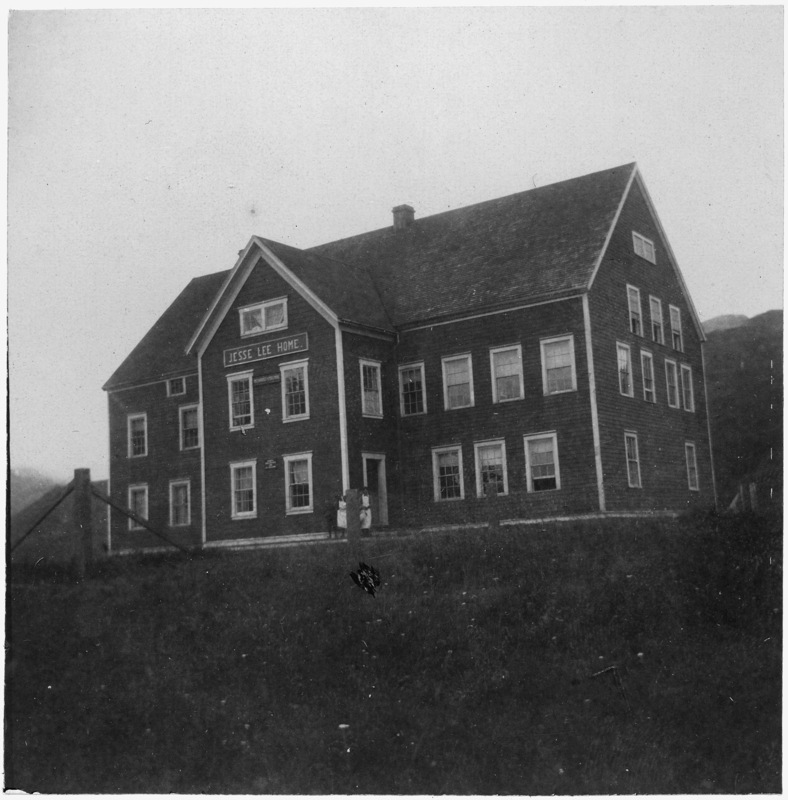 The Jesse Lee Home in Unalaska was home to hundreds of Aleut orphans. It eventually moved from Unalaska in the Aleutian Chain, to the town of Seward on the mainland. It was from here that Benny Benson sent his design for the Alaska flag, as a seventh grader. 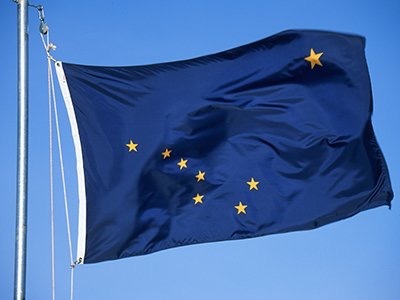 The Territorial Legislature approved the new flag in May of 1927, and Alaska officially flew its new flag for the first time on 9 July 1927. Benny Benson received a watch, with the flag design etched on it, as well as a $1000 educational scholarship, which he eventually used to become a diesel mechanic. Benson Boulevard in Anchorage, which is a major east-west thoroughfare, is named after Benny. A Benny Benson Memorial is located at milepost 1.4 of the Seward Highway in Seward. The airport in Kodiak was renamed the Kodiak Benny Benson State Airport in 2013. A school in Anchorage on Campbell Airstrip Road has been named the Benny Benson School. Benny Benson died of a heart attack in 1972. He was 58. Fairbanks hit 90 degrees on Friday, which broke the record of 87 set in 1957. It was also the second earliest date, Fairbanks has seen the temperature reach 90. That record is 28 May, which was set in 1947. 90 degrees, is just too damn hot for Alaska, and those temps can stay in Texas. Luckily, temps are dropping down to a more Alaskan-like 75 for Saturday. 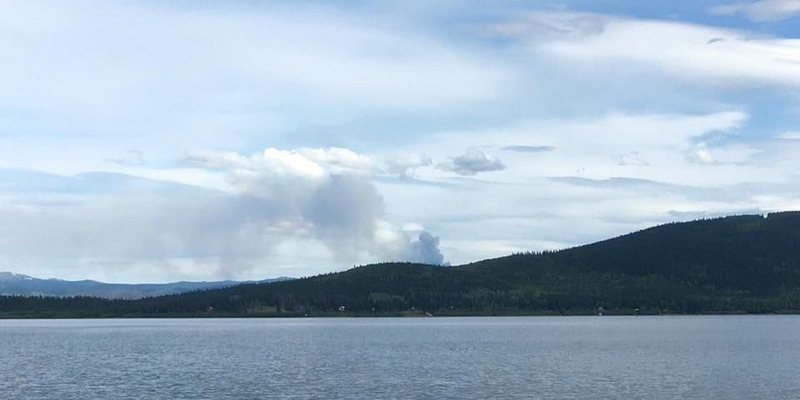 Lightning caused the South Fork Salcha fire, which has closed the Richardson Highway tonight near Birch Lake. 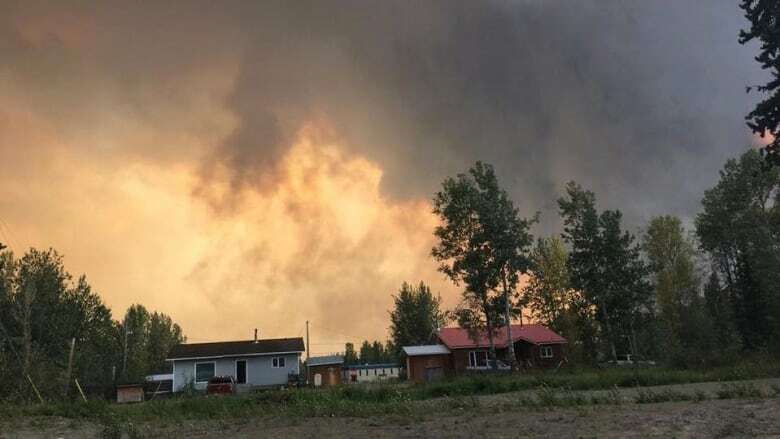 The lightning strike occurred Thursday morning, and by Friday evening, the fire had reached 3600 acres. I noticed the scent of burning black spruce Friday morning, as I drove to the jobsite. Summer has reached the Interior. 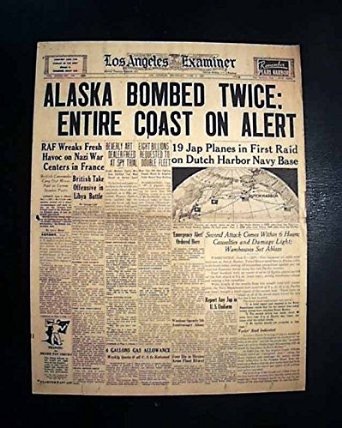 On this date, 75 years ago, the Japanese launched two aircraft carrier raids on the remote Alaskan community of Dutch Harbor. The second is that the Japanese wanted to have a north-south patrol line with Kiska, Alaska as its northern anchor. This was especially important after the Doolittle raid on Tokyo in April of 1942. And thirdly, and probably most vital, the attacks on the Aleutian Islands was suppose to draw units and ships away from the looming Battle near Midway. 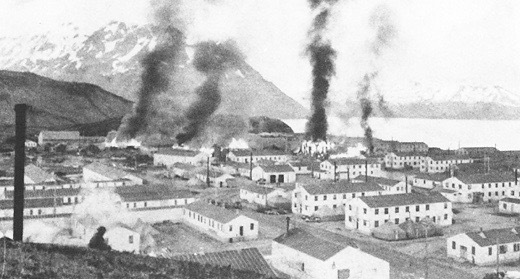 Because of the U.S. Navy code breakers, the Americans knew about both Midway and the attack on Dutch Harbor on the 21 May. With limited resources and unpredictable weather, the Americans were as prepared as they could be. At 0258 hours June 3, 1942, the Japanese launched 12 Zero fighters, 10 Kate high level bombers, and 12 Val dive bombers towards Dutch Harbor. At 0407 the first planes appeared over the harbor. Anti-aircraft flak was heavy as the planes came in low enough for men on the ground to clearly see the pilots faces. 17 men of the 37th Infantry and 8 from the 151st Engineers died when a bomb exploded on a barracks at Fort Mears. Half of the Japanese planes did not reach their target. Some got lost in the fog, returning to their carriers, and some simply crashed into the rough seas. 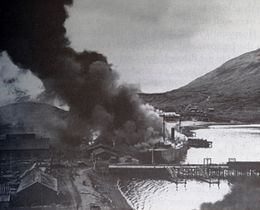 The beached barracks ship Northwestern burning. The Japanese once again launched attacks on June 4th. More targets were hit, but there were fewer casualties. Oil storage tanks were hit, as well as more barracks, a wing of the hospital and two merchant ships in port. The Northwestern was also hit. The transport ship had been grounded and used as a barracks. After the battle, the hull was saved, and the ship’s power plant continued to bring steam and electricity to the shore installations. At this time, an amphibious attack on the island of Adak was launched, which was 480 miles to the west of Dutch Harbor. The Japanese would find that Adak was not occupied by any U.S. force. 78 American soldiers died in the battle. 14 U.S. planes were damaged. Ten Japanese died in the attack, and five were captured. Eight aircraft were destroyed. 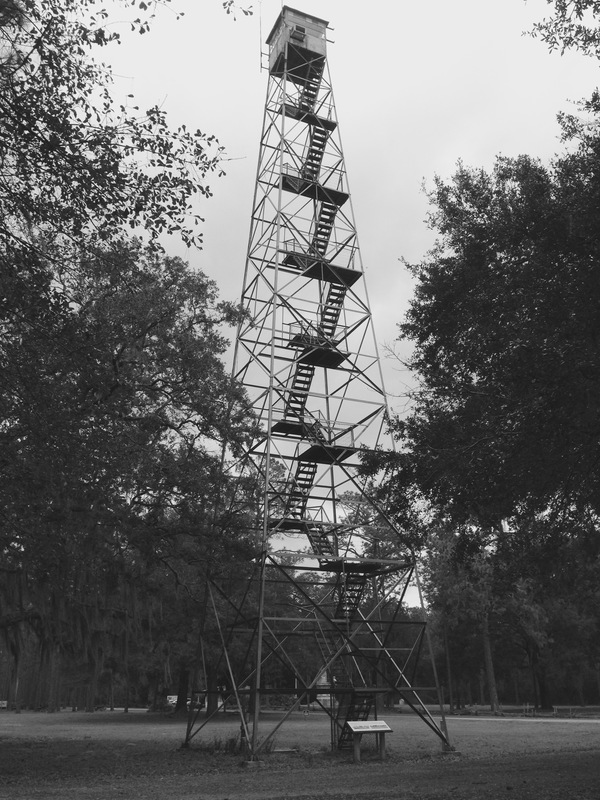 A fire tower in Florida, that was closed off to climbing, although it wasn’t that difficult to make it to the top anyway. With Florida being as flat as it is, I was surprised the forest service thought they needed one this tall. The hardest part about leaving Alaska’s Interior in the winter, is returning to the Interior in the winter. Especially, when you rely on a wood stove for your heat source. It was in the vicinity of -22F outside when I unlocked the cabin door. My ride from the airport was in a car with a thermometer that stops at -22, and my outdoor thermometer finally gave up the ghost around September. 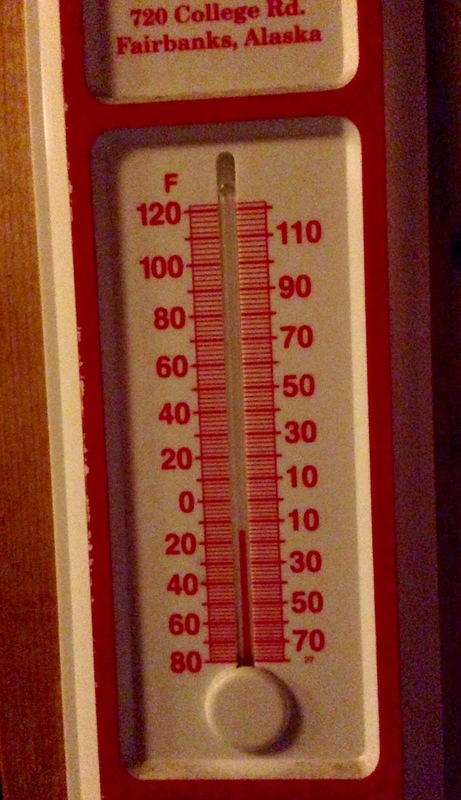 The thermometer inside the cabin clearly read -15F. 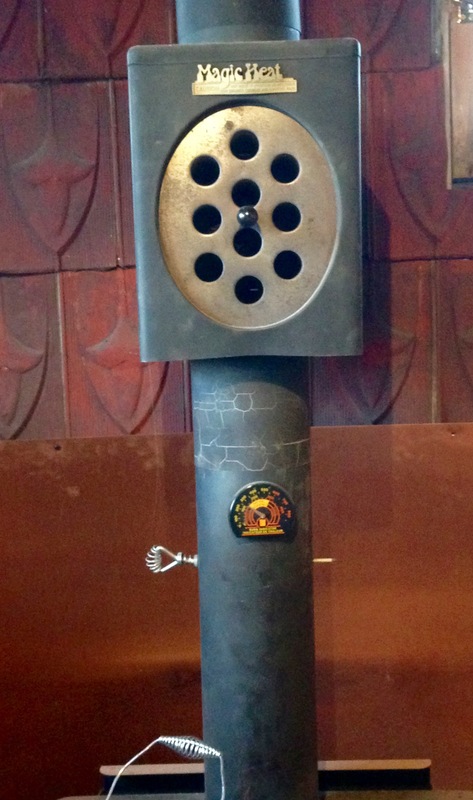 Get a fire going in the wood stove. Start the truck, and let that warm up. Add firewood and plug in the stack robber. Drive to the store to pick up enough groceries to get me through a day or two. Return to a slightly warmer cabin, add firewood, turn on the heated mattress pad, then walk over to the neighbor’s for dinner. I left Alaska in such a hurry that I forgot to have kindling ready. First step was to put on a hat and warmer gloves. It was 6pm. Second step was to split some spruce for kindling. Once the fire was going, I went out to start the truck, but my neighbor did not plug it in like I requested. For the first time, my Chevy did not start. Returned to cabin to add firewood and plug in stack robber. Walked over to the neighbor, and casually mentioned my truck did not start. Borrowed neighbor’s warm car to drive to town. Returned with groceries to a cabin that had warmed to -5F. Progress at 8pm. Walked over to neighbor’s for a strong cocktail, and dinner. Returned to my cabin at 10pm to add firewood and crank up heated mattress pad to a level I’ve never experienced before. The cabin was now at +20F. Went back to neighbor’s for another cocktail. Returned to my cabin at midnight. The air temperature was +55F inside the cabin. Tolerable. 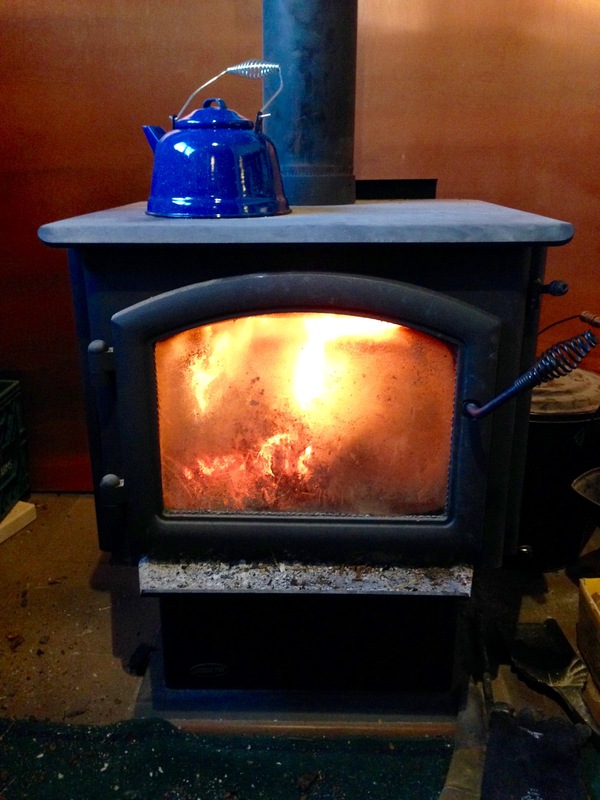 I filled the wood stove, and went to bed exhausted. I had been up for 23 hours. Love travel days. Was awake by 7am. The cabin was now 65 degrees. The water jug on the counter was starting to thaw; those on the floor were still solid blocks of ice. It total, in took 36 hours for the cabin to truly heat up, reaching all nooks and crannies, and for walls, furniture and a fully stocked wood pile to stop radiating cold. Chevy starts up immediately after being plugged in overnight.